Genetic testing enables you to compare your genes with other families and ethnic groups. The database includes not only Latvians but also Lithuanians, Russians, Estonians, Finns, and most other peoples of Europe. If you're a Latvian in your maternal or paternal lineages, you'll become eligible to join the "My FamilyTree DNA Latvia Project". Latvia is a small country in northeastern Europe sandwiched between Lithuania to the south and Estonia to the north, with Russia to the east and Belarus to the southeast. Its western edge is bordered by the Baltic Sea. The Latvian and Lithuanian languages are the modern members of the Baltic language family. They're similar but not mutually intelligible. R1a is the primary Y-DNA (paternal) haplogroup among Latvian men, with 40 percent carrying it. R1a arrived in eastern Europe when the Indo-Europeans migrated to the Ukrainian-Russian steppe. R1a is also the most frequent haplogroup found in Lithuanian men. 38 percent of Latvian men belong to Y-DNA haplogroup N1c1. The common European haplogroup R1b was discovered in 12 percent of Latvian men. Rounding out the list of Latvian Y-DNA haplogroups are I1 (6%), I2a (1%), I2b (1%), J2 (0.5%), E1b1b (0.5%), Q (0.5%), and T (0.5%). The most common mtDNA (maternal) haplogroup among Latvians is H, found among about 45 percent. About 23 percent belong to haplogroup U, of which 3% are within subclade U2, 2% within subclade U3, 9% within subclade U4, and 9% within subclade U5. Haplogroup T is found among 9% and J is found among 6.5%. 4.5% are in I, 4% in W, 3% in V, 2.5% in K, 0.5% in X2, and 2% in other haplogroups. L. Pliss, Kristiina Tambets, E. L. Loogväli, Natalia Pronina, M. Lazdins, Astrida Krumina, Viesturs Baumanis, and Richard Villems. "Mitochondrial DNA portrait of Latvians: towards the understanding of the genetic structure of Baltic-speaking populations." Annals of Human Genetics 70, Part 4 (July 2006): pages 439-458. "Sequencing of the first hypervariable segment (HVS-I) in combination with analysis of informative coding region markers revealed that the vast majority of observed mtDNAs belong to haplogroups (hgs) common to most European populations. Analysis of the spatial distribution of mtDNA haplotypes found in Latvians, as well as in Baltic-speaking populations in general, revealed that they share haplotypes with all neighbouring populations irrespective of their linguistic affiliation. Hence, the results of our mtDNA analysis show that the previously described sharp difference between the Y-chromosomal hg N3 distribution in the paternally inherited gene pool of Baltic-speaking populations and of other European Indo-European speakers does not have a corresponding maternal counterpart." 114 mtDNA samples and 113 Y-DNA samples were obtained from Latvians and compared with the people of Lithuania, Estonia, Finland, Karelia, Setoland, and Sweden, with ethnic Russian data also incorporated. The total number of samples exceeded 1,200. Of the 114 Latvian mtDNA samples, 40 of them belonged to haplogroup H and 42 to U. On the Y-DNA side, of 113 Latvian samples 47 belonged to N3, 44 to R1a1, and 4 to I1a. The study's tables also provide the frequencies for other mtDNA and Y-DNA haplogroups that were encountered among the sampled Latvians. 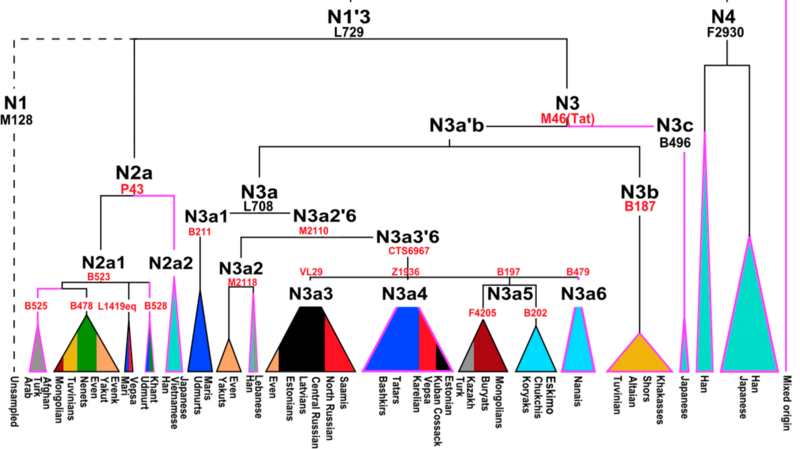 A Y-DNA haplogroup within the N family that Latvians sometimes carry is N3a3. Y-DNA chromosome bialelic markers are similar between Latvians and Lithuanians and these two groups also have similarities in that respect with Estonians and Mari (Finno-Ugric peoples).